When I first came across Audrey, Wait! in my library, I dismissed it as being a rather silly novel. You see, I can be a very snobbish reader. Unless a book screams "DEPTH!" to me, I usually walk away from it. Well, then I joined GoodReads and virtually all my friends have loved this novel - even those who aren't fans of contemporary literature. As such, I couldn't help but pay my library another visit and check out the excruciatingly bright hardcover edition of this book. I kept expecting myself to be similarly blown away by this novel as my friends were, but I wasn't. Nevertheless, I do have to admit that Audrey, Wait! made me laugh at a time in my life when I wanted to cry and the amount of time I spent immersed in this fun-filled world is one I don't regret. Not one single itty-bitty bit. Audrey, Wait! is the simple story of a girl who breaks up with her boyfriend. Or, not so simply. When your boyfriend is in a band, he might just end up writing a song about you. And that song might just gain attention and publicity. And that might just make you famous as well. Which, in turn, might just make falling in love with the cute guy at the ice cream shop you work at a lot more public than it needs to be. Or going for a concert. Or even sleeping in class. Needless to say, Audrey's life is turned upside down by the sudden fame she receives from breaking up with her boyfriend and if you thought being a celebrity was fun, Audrey will make you think again. One of the best aspects of Audrey, Wait! is its narration. From the first page itself, Audrey grabs you and doesn't allow you to put down her story. Not only is she spunky and sarcastic, but her dialogue and life story is surprisingly relate-able and real. From the deep bond between Audrey and her best friend, Victoria, to the adorable crush she has on James, and the understanding relationship she maintains with her parents, this book never let me stop smiling. In fact, I blame this book for making my cheeks hurt so much by the end of it. If that wasn't good enough, though, Audrey loves music and the lyrics dispersed throughout the chapter titles made me grin even more. Audrey, Wait! is also a surprisingly solid representation of paparazzi and the culture of today's world, which I most definitely appreciated. It wasn't too over-done, like the crazy paparazzi of many movies, but it wasn't subtle either, striking a good balance. Yet, unfortunately, Audrey, Wait! really does lack depth. Audrey not only gets along perfectly well with her parents, but any issues she has with Victoria and James are swiftly dealt with as well. Audrey's school nemesis is seen as "that girl" that exists in every novel to make the protagonist appear a little better and with the exception of the multi-faceted and flawed personalities of Audrey and Victoria, not much else proved that this novel was worth the hype it received. Thus, my rating is based solely on my thorough enjoyment of this tale and the fact that, every once in awhile, we all need a good laugh. For the next time you find yourself in that kind of mood, pick up Audrey, Wait! It'll have you in splits of laughter within pages. Just see if it doesn't. Moon Called is a promising start to a new urban fantasy series. Although it definitely starts out on a stronger note than, say, Magic Bites, I can't see it trumping Kate Daniels for my favorite UF Series anytime soon. Nevertheless, I thoroughly enjoyed my first foray into the world of Mercy Thompson. Mercy, a mechanic, is the type of protagonist you cannot help but love. Not only is she independent and sassy, but her strong will and witty humor kept me flipping the pages frantically. Mercy has grown up with werewolves although she isn't one herself. Instead, Mercy is a rare type of shapeshifter called a 'walker' and known for her ability to shift into a coyote. Although a coyote is no match for a werewolf, Mercy's connection with werewolves makes her the perfect narrator for this UF Series that promises plenty of paranormal fun. I simply ate up Moon Called like a starved child. Mercy is a delightful heroine and although her narration isn't close to as funny as that of Kate Daniels, it was refreshing. For fans of romance, though, Moon Called may be a tiny bit disappointing. Samuel, the werewolf who Mercy has been in love with since she was a teenager, makes a reappearance and the dynamic between him, Mercy, and Adam is sizzling. Although I despise love triangles, the romantic entanglements were so muted in this novel - not to mention unique and interesting - that I find myself looking forward to the drama sure to ensue in the sequels. Adam and Mercy share an interesting relationship, to say the least, but once again, any type of tension between them is very subtle with a greater emphasis given to the plot. Yet, from Moon Called, you wouldn't think that Patricia Briggs is a particularly good author. Granted, her characters all have their fair share of depth, but at times, the dialogue is stilted and the writing itself is awkward. It becomes a little difficult to follow the plot at times and just past the half-way point, the story drops and becomes ever-so-slightly boring. Even in the beginning, despite its riveting quality, the novel is bogged down with long passages of world-building that could have easily drawn away a less perseverant reader. Nevertheless, as with most UF Series, I suspect everything will really begin to pick up with the second novel and you can be sure that I will stick around for the long journey in front of Mercy Thompson. I always need books in my life that make me smile and laugh. Pallet-cleansers as I've said before. I have yet to read Audrey, Wait! but I'm looking forward to opening it soon and enjoying the experience. I'm always intrigued by tales of people who have to deal with sudden fame and paparazzi. The heroine's voice in Also Known As was also conversational and engaging, and I'm excited to be in Audrey's head as well. On GR I can tell that you've been tearing through this UF series. I will definitely keep it on my radar, though Kate Daniels will be the series that I pick up next when I'm ready to start one of these. But I would not know about these books without you, so thank you for sharing. Great reviews! Love your interesting pairings. I have never read this particular Urban Fantasy series but I love a great UF when the mood strikes. They are FABULOUS when the time is right. But Audrey, Wait! is one that I absolutely loved without a doubt. I have to admit that the lack of depth didn't bother me at all - in fact, it's one of the reasons that I liked it. It made me laugh loudly and often, it had GREAT music and lyrics, the family dynamics were attractive, and the romance between Audrey and James was really cute. The reason that I waited to long to read it is the cover. But when it was recommended and gifted to me, I decided that if practically all of my reading friends liked it a lot, there had to be something to it. When I started it, I saw what I had been missing. I find that I have to keep books like this on my radar for those in-between times - between heavy books or particularly long books. This one is one that I'll definitely re-read when I need something like that. Perhaps I'll even check out more by this author since everyone seems to love her work. I thought Audrey, Wait was so fun! Sometimes I just need a book that would lift me up and the ice cream factor was a total plus. don't normally read urban fantasy but I might need to pick this one up to see, especially since the author is so well known! I don't think I'd be tempted to pick up the cover of Audrey, Wait! by its cover. But it sounds like a fun - if unrealistic - read and so I'll see if it's available at my library. You can never have too many feel good type of reads in your TBR pile. I've been meaning to read Moon Called for an AGE. And it's fascinating, the lines you draw between it, and Magic Bites. I loved MB, though I've only read PART of MC (like, the first 30-odd pages) and.. yes. PARALLELS. Hmmm. Shame about how you've described the writing, but STILL! 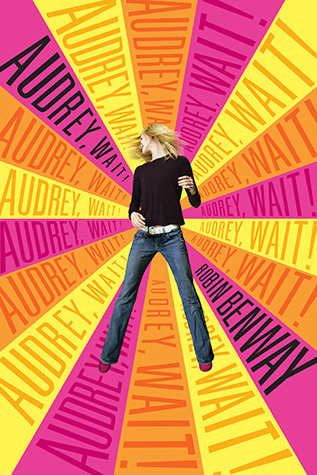 Audrey sounds like just the MC I like to read about, so I feel pretty bad that I have a copy sitting unread on my shelf! Thanks for the reminder! *HAPPY DANCE KEERTANA* I'm so excited you're into the Mercy Thompson series now! First Kate, now Mercy:) You're reading some of my favorite series, and it's making me wish I could go back and experience them for the first time all over again. Like Kate's books, I think the Mercy books get stronger as they go, so I'm looking forward to your thoughts on the rest of them! Haha, and you KNOW that I just loved Moon Called to pieces. I just instantly fell for this series, despite its small flaws that you mentioned. I actually like that romance tends to get drawn out in these longer UF series, because otherwise I'd just get bored (though I hope she doesn't go the Seanan McGuire route and torture me for SIX BOOKS). Just started the audio for book 2 yesterday! Again, why is it that your mini reviews and up being longer (and better) than my regular ones? You're giving me an inferiority complex. I love how Patty's experience with horses gave her so much insight into animal behavior and body language. She uses it very well in both series. I'm glad you raced through this, I did too, back when there were only five books, and now every time a new one comes out, all I can think about it how long I have to wait for the next book. I will always have a special place in my heart and my shelf for Mercy Thompson. It was my first UF love and the quality is still there in Frost Burned. Having said that, KATE DANIELS!! So good.